He said the scheme was the latest milestone in a vision - a vision that imagines a Fiji far bigger, far better and far more advanced than today – all for the benefit and well-being of our people. Prime Minister Voreqe Bainimarama says more than 300,000 Fijians stand to benefit from an $855 million investment in the Rewa River Water Supply Project. He says they will enjoy more reliable access to clean water and lead healthier lives. Yesterday he signed at the Grand Pacific Hotel in Suva two contracts valued at $266 million to cover the design, construction and operation of the scheme. He said the scheme was the latest milestone in a vision – a vision that imagines a Fiji far bigger, far better and far more advanced than today – all for the benefit and well-being of our people. 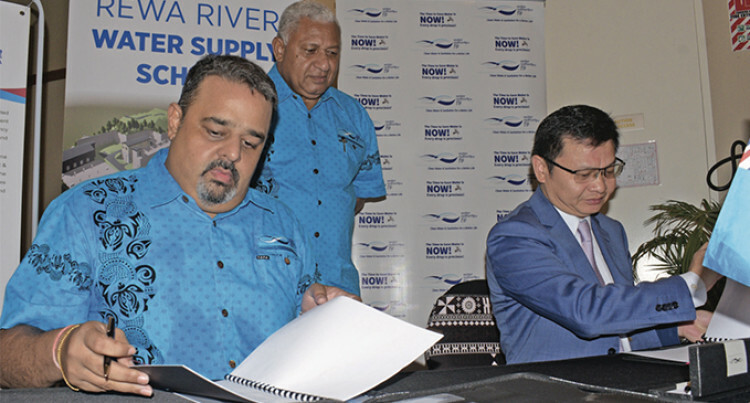 He said this Rewa River Water Supply project was only one piece of a massive Urban Water Supply and Waste Water Management Project undertaken by his Government. He said they would be signing more agreements in the near future to advance those projects, and they looked forward to continuing their close work with the Asian Development Bank (ADB), European Investment Bank (EIB) and Green Climate Fund (GCF) and their other development partners to make it happen. He said past Governments when carrying out developments acted for today, without thinking for tomorrow. “It only takes a drive around Suva to realise very quickly that not every government used to consider the long-term realities of our nation’s development. Our roads weren’t originally designed to be widened and expanded; basic services infrastructure wasn’t designed for future growth; and trends in demographic movements weren’t factored into decision-making,” he said. In many cases, he said, those over- sights made present developments far more expensive than they ought to be. Government, he said, had set out the vision for this project, they had put the funding in place, but it would take consistent and stringent project management to see this initiative over the finish line. He said their commitment to supplying clean water applied to every Fijian, everywhere in the country. From the most densely populated urban centres to the most remote pockets of Fiji, they were working to ensure that accessing clean water was never a struggle. tanks and rainwater harvesting systems,” he said. The completion of stage one of this scheme he said would add a minimum production capacity of 40 megalitres per day to Fiji’s national network of water infrastructure. This new water system he said would be built in such a way that production could be further expanded as demand continued to grow. Stage two of construction will double the system’s capacity to 80 megalitres per day, and stage three will enable this systems to generate, at minimum, 100 megalitres of water in a day. Yesterday’s signing was closing the door on a future of water scarcity and poor water quality for the Suva-Nausori corridor and government was laying a strong foundation for a new Fijian future, he said.